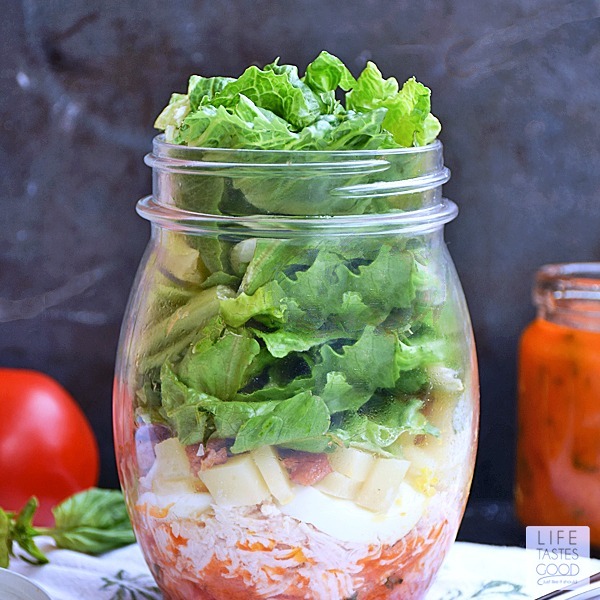 Cobb Salad in a Jar is a convenient way to take a fresh meal with you anywhere you go! Work, school, picnics, road trips, you name it! This salad likes to travel! Just add a fork <smile>. It's also the perfect make-ahead meal to have on hand for those busy days when you are just too tired to cook. This week the #SundaySupper Tastemakers are sharing recipes that travel. Summer is in full swing with lots of summer fun happening. We all need great recipes that travel well for vacations, picnics, barbecues, potlucks, you name it! Be sure to scroll down for the links to all of the recipes so you don't miss a thing! 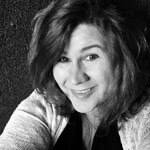 I'd also like to thank my co-hostess with the mostess, Coleen of The Redhead Baker, for teaching me how to host a #SundaySupper event. Thanks, Colleen! You are the best! I hope I didn't screw things up too badly! Don and I hit the road several times a year to visit Madison wherever she might be. For the past 4 years I feel like we've worn a groove on 95 north to Savannah when she was attending college at the Savannah College of Art & Design. Since she graduated recently, we won't be making that trip as often as I like, but we'll still be traveling to visit our girl. Currently she is in Hong Kong!! Wish I could visit her there!! She was chosen by her college to participate in an all-expense paid Cultural Experience Trip (of a lifetime). Only a small number of students at the top of their class were chosen, and they are traveling with some of the professors to exhibit their work in Hong Kong, as well as experience the culture and take in the sights. It is a 2 week trip and just as soon as she gets back we are setting out on the road to move her to her new city for the rest of the summer. She landed a summer internship in North Carolina and is very excited about the move. You can bet I'll be packing these salads! Eating a fresh and healthy diet has always been a challenge on the road. We want something quick, but we also want something that tastes good. What is the point of eating all those calories if you don't enjoy it? Since I discovered how to make salads in a mason jar on allrecipes.com, we can enjoy fast, fresh, healthy, and great tasting meals on-the-go. I was a bit skeptical at first. I wasn't too sure the lettuce would stay fresh in that jar for several days, but it does! It stays crisp and delicious like a just made salad should, and my favorite part is I can put whatever I want in the jar, so I'm not stuck with the limited choices at fast food joints. I like that! The trick is to layer the salad properly. The dressing always goes on the bottom, next up will be those tough veggies that won't soak up all the dressing and get soggy, like grape tomatoes or carrots. On top of the veggies add some protein such as chicken and then some goodies like hard boiled eggs, cheese, and bacon. Lastly is the lettuce. 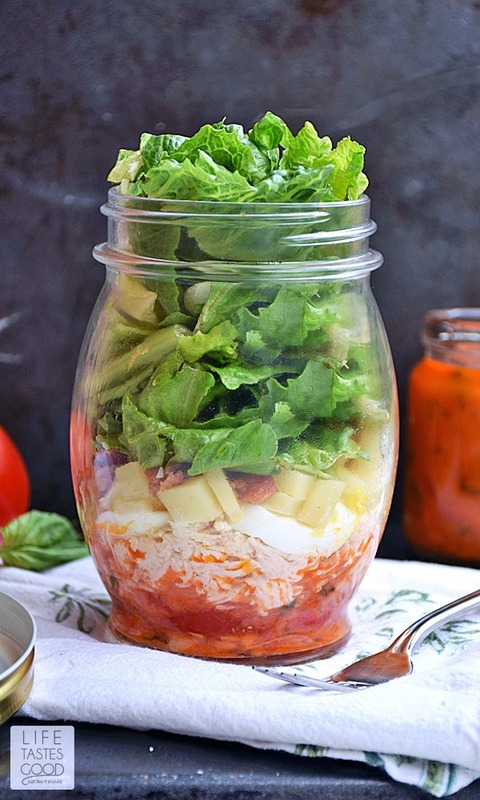 Screw on the lid and store your salad in a jar in the fridge for up to 5 days. When ready to eat, you can shake it all up and eat right out of the jar if needed, or pour the salad onto a serving dish and enjoy! Don't forget a fork!! 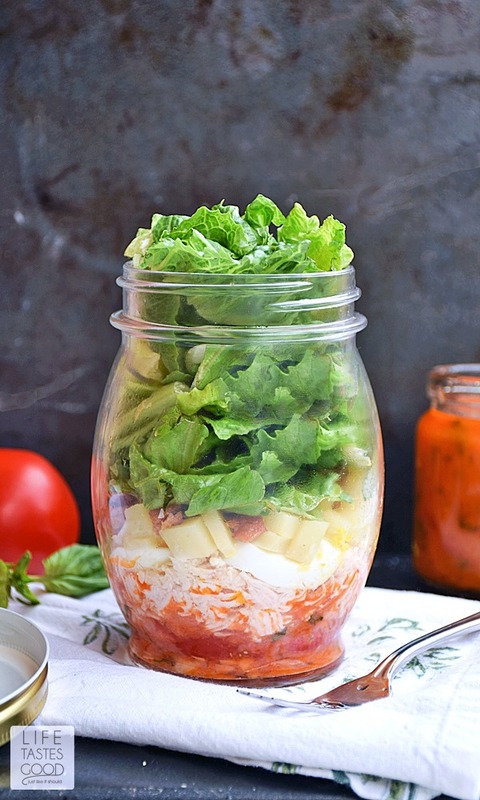 Salads in a jar are great to make up on the weekend for a quick lunch during the week, but I also love to enjoy them for dinner on those nights when I don't feel like cooking. You can put any combo of flavors in the jar that you like, just be sure to layer the ingredients so things don't get soggy. Soggy salads are sad salads and we can't have that! I chose to go with a Cobb Salad for my salad in a jar. Cobb Salad is a hearty, main-dish salad that includes many of my favorite things, but I did swap out the blue cheese for Gruyere as a personal preference. I also left the avocados out, because avocados are very sensitive once you remove the skin, and I didn't want any yucky brown avocado pieces in my salad. Once they turn, they turn me off! Other than that, my Cobb Salad starts with a homemade Tomato Vinaigrette Dressing I add to the jar first. I toss in some grape tomatoes and layer my shredded chicken on top of that. The tomatoes and the chicken will protect everything else from the dressing, so now I can add pretty much whatever I like. Next up was a sliced hard-boiled egg, Gruyere cheese cubes, some diced bacon, chives, and in the space that was left I stuffed in the greens. If I'm going to be enjoying this right out of the jar, I do leave a little space at the top so I can shake it up and dig in. Doesn't get much easier than that! about 2 cups of Romaine lettuce or a mixture of lettuce greens works great too. 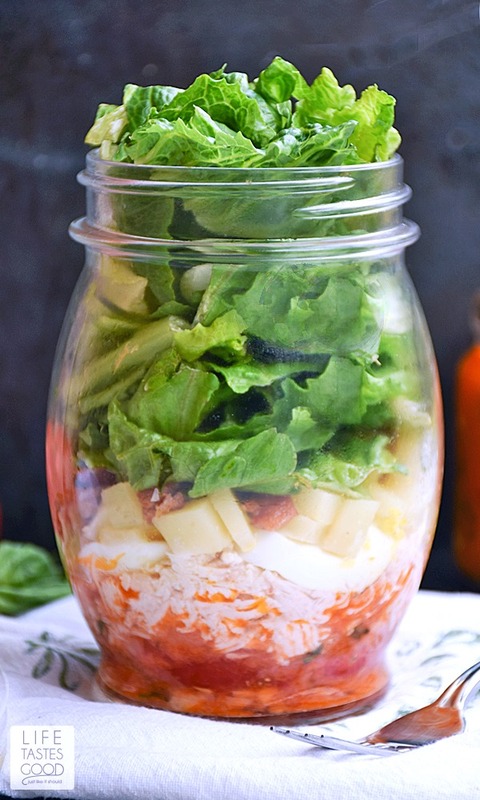 Layer the ingredients in the mason jar as follows: 1/4 cup Tomato Vinaigrette Dressing, grape tomatoes, 1/2 cup shredded chicken, 1 sliced hard-boiled egg, 1/4 cup cheese cubes or crumbles, diced bacon, a tablespoon of chopped chives, and about 2 cups lettuce greens. The amount of lettuce will vary depending on if you want to stuff the jar full or leave some space for shaking up and eating straight from the jar. Screw on the lid tightly and refrigerate for up to 5 days. When ready to eat, spoon out the salad onto a serving dish or shake it up dig right into the mason jar. Enjoy! Interesting how the lettuce stays crisp. I've always wondered about that and nice to know I can make a few of these on the weekend and have a quick lunch during the week. This would be sooooo much better to eat on the road than the usual fast food options! Great choice for this wonderful theme, Marion. Thank you so much for hosting. P.S. Last time I was in Hong Kong we were exploring and walked right by SCAD there! Your daughter is going to have so much fun! Pretty cool Marion, Love the look but best of all I love the fact you have nutritious good for you food to take on the road! I agree with Stacy this is a great road trip salad. We have a plugin cooler and always bring a meal on our road trips. Will have to try this one next time. It would be so exciting to go to Hong Kong. What a fantastic trip. I love that you packed the salad in a Mason jar. First off, thank you so mcuh for hosting and secondly that salad looks really amazing. Everything I love!! Good to know the lettuce stays fresh - that would always be my concern so great it stays crisp. They look great and agree a nice alternative to what you may otherwise be stuck with on the road! This is a great idea to have salad on the go! This looks fantastic! I love that they can be made and eaten up to 5 days later! So yummy! I love every single layer! What a magnificent portable salad, Marion. Thanks so much for hosting us this week!!! What a great way to pack up a salad to carry for a work lunch or a picnic in a park. Genius. Great idea! Being able to take a salad on-the-go is genius. Aren't jarred foods so much fun! Thank you for visiting my blog, the banana pie in a jar. I cannot wait to make your salad for a picnic! Love, love this! It looks like the perfect picnic salad. Thanks for hosting this week. I keep meaning to try out salads in jars. They are such a great idea for packed lunches. Yours looks so pretty!